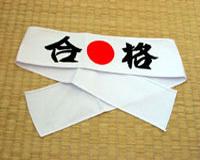 This hachimaki headband features a rising sun and the kanji for Gokaku - made up from the Japanese characters meaning "to be correct" and "status" or "rank". The overall meaning is "success" or "passing exams". Ideal for students approaching tests or examinations.